Good evening, dear readers! I hope this post finds you well and you have been enjoying the week thus far. I have some amazing Zoya polishes to share with you tonight. I have been really excited about the Entice & Ignite collections since seeing them during my visit at the Zoya booth at Cosmoprof North America in Las Vegas, and you have no idea how glad I am that they are now available for purchase! I enjoy a wide range of polish colours and finishes, but there is just something about the warm shades associated with Fall that makes it arguably my favorite season for polish colours. For tonight's blog post, I wanted to focus on Entice, Zoya's creme collection for Fall 2014. Fall just isn't quite right without a rich brown shade, and Zoya nailed it with Nyssa. I'm definitely going to be wearing this gorgeous milk chocolate shade often! The formula was perfect- not too thick or thin, and I used two coats for this photo. I've recently developed a love a red polish, but they have nothing on Claire! Described as a rich burgundy, this is my favorite from the Entice collection. It applied easily with two coats. I anticipate needing another bottle of this beauty by the end of the season! A brilliant wine, Veronica is another one of my top picks from this collection. It has just the right amount of brightness while still being Fall-appropriate. I formula on this one was good as well, and I used two coats for this photo. If you prefer more of a purple shade, then Margo is right up your alley! It is the "Fall version" of radiant orchid, the colour of the year, and absolutely beautiful. Again, this one has a nice formula. I used two coats for this photo. Ryan is described as a classic indigo and will match most of my Fall wardrobe. In spite of having a large collection of dark blues in my wardbrobe, I rarely think to grab one for on my nails. I suspect that is going to change this year as Ryan is such a gorgeous blue polish with a great formula! I used two coats for this photo. Genevieve was one of the polishes that grabbed my attention right away when I first saw it. While don't wear grey polishes often, I really like the dark smokiness of this one, and the nice formula is an added bonus. I used two coats for this photo. Zoya has really won me over with their Fall creme collection. 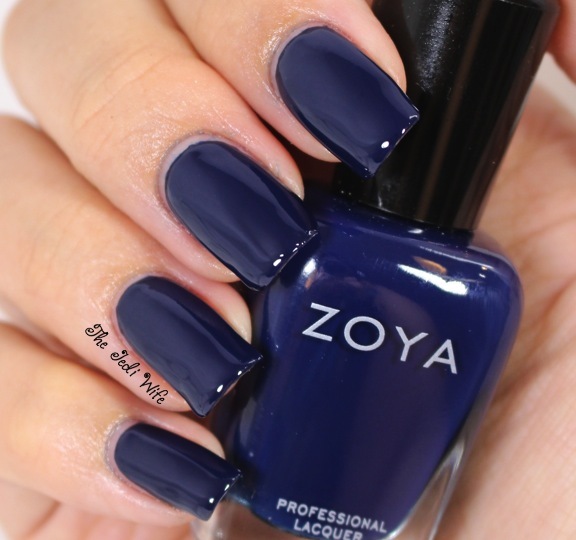 Their formula is perfect, but what else can I expect from Zoya- they're always great for me! The Entice collection is filled with deliciously rich shades that are perfect for the season as the days get colder and the nights last a little longer. The Entice collection is currently available for purchase at Zoya.com for $9 a bottle. What do you think about the Entice collection? Are there any shades you have your eye on? I'd love to hear from you!